Harness the power of herbal tea during pregnancy and postpartum! This post explores some of the best tea for pregnancy. 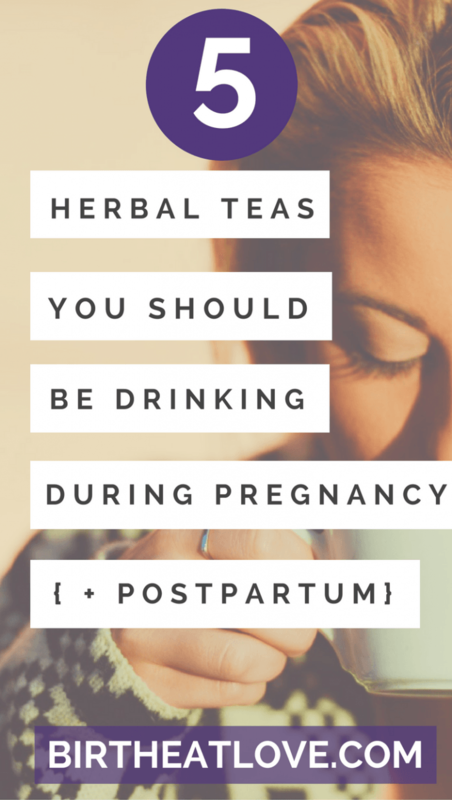 Drinking herbal pregnancy tea is an easy way to boost nutrients so you can grow a healthy baby. During the postpartum period, herbal tea can provide nourishment for the body to heal. Are you wondering if you can you drink tea when pregnant? Wondering if herbal tea is safe during pregnancy? Want to know the best tea for pregnancy and postpartum? Being a big tea drinker, I was excited to learn that tea was an not only an acceptable drink during pregnancy, but also a nourishing one. Drinking tea is actually one of my secrets, as a mama of 4, to feeling great during pregnancy and preparing for an easy labor. For thousands of years, women have used herbs to strengthen their bodies for labor and childbirth. Today it is easier than ever to access this wisdom and herbal teas that can help nourish and heal your body. 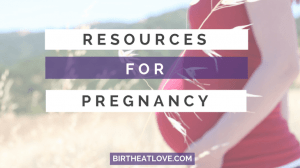 This post is Part 2 of the Nourishing Your Pregnant Body Series dedicated to helping you learn how to care for yourself during pregnancy and postpartum by focusing on what you put in your body. Drinking tea during pregnancy is one of those essential things you really should be doing in conjunction with starting a healthy pregnancy routine and nourishing your body. 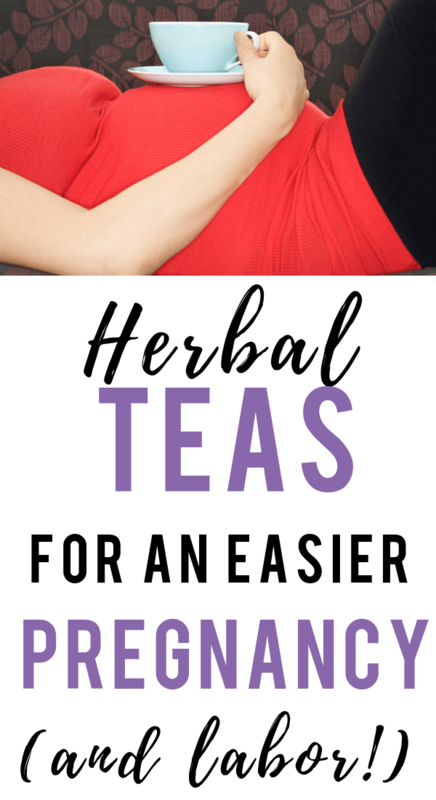 Read on to learn which herbal teas are the best to drink when pregnant, how to use herbal tea to ease pregnancy related ailments and how to heal during postpartum recovery. 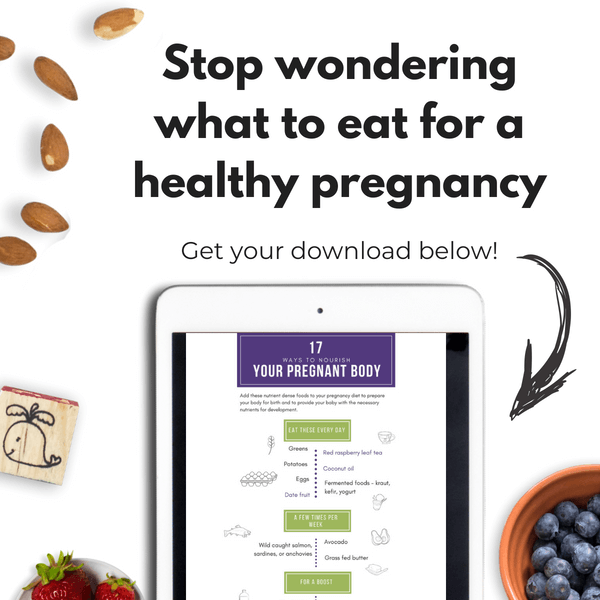 Make sure to download your FREE PDF with 17 Ways to Nourish Your Pregnant Body – it’s my best recommendations on how to feel your best during pregnancy. Here are the answers to a few common questions that mamas ask about drinking herbal tea during pregnancy. Herbal tea, or what some might call herbal tonic or infusion, uses flowers, seeds, roots, berries or leaves of plants that aren’t from the tea plant. Steeping the herbs in hot water for an extended time (anywhere from 10 minutes to 4 hours) just as you would tea releases the medicinal properties. Is tea safe for pregnancy? Yes! Tea has less caffeine than coffee and many beneficial nutrients for mom and baby. Teas that are generally considered safe include black tea, green tea, rooibos tea and the herbal teas listed below. So why should I be drinking tea during pregnancy? Well the simple answer is because its good for you. Herbal tea is packed with nutrients including calcium, iron and magnesium that you need to nourish your pregnant body and grow a healthy baby. Plus herbal tea is caffeine free, making it a good alternative to coffee. And herbal tea can relieve pregnancy symptoms like morning sickness and swelling, as well as help your body recover from childbirth naturally. Herbal tea is a natural alternative to over the counter medications during pregnancy. Is it safe to drink herbal tea during pregnancy? It is always best to consult your care provider for guidance, but all of the teas listed in this article are generally accepted as being safe to drink during pregnancy and while breastfeeding. Always look for adverse reactions with anything you put in your body during pregnancy and discontinue if unwanted symptoms occur. 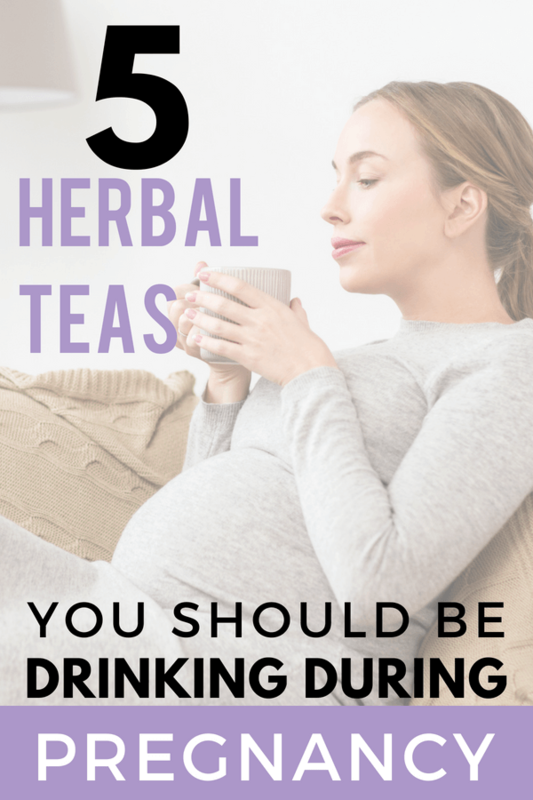 How often should I drink herbal tea while pregnant? Most tonics need to be used regularly, for a tonic is to the cells what much like exercise is to the muscles: not much use when done erratically. 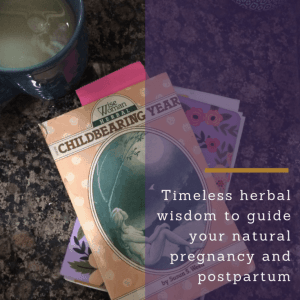 Always having been fascinated by the healing power of herbs, I was blessed to be gifted a copy of Wise Woman Herbal for the Childbearing Year early in my motherhood journey. It is filled with excellent advice on how to use herbs to nourish your body during pregnancy and postpartum. I used the advice that I found in this book and my personal experience as the basis for the best pregnancy tea recommendations. Added nutrients -Red raspberry leaf contains a high amount of vitamin C, as well as, vitamin E, calcium and iron. It also contain vitamin A and B complex. Can help to bring down an undelivered placenta. Red Raspberry Leaf – the best tea for pregnancy! To get the full benefits of red raspberry leaf while pregnant drink 1-3 times daily throughout pregnancy. I highly recommend bulking up on this tea, as you will go through A LOT of it if you drink it daily. This is my favorite big bag of loose red raspberry leaf to make tea available on Amazon. It’s organic and super fresh! There is conflicting information all over the internet in regard to when to start drinking red raspberry leaf tea. The book I trust is the Wise Woman Herbal for the Childbearing Year which recommends it for morning sickness. Other sources say to err of the side of caution and wait until at least 16 weeks. Consult sources you trust and your care provider before drinking red raspberry leaf tea in the 1st trimester. Are you getting close to labor? Give this recipe for Red Raspberry Leaf Pregnancy Iced Tea a try! After reading about nettle tea in Wise Woman Herbal, I was sold on drinking it daily. I actually like mine with a little almond milk and honey. I love the flavor so much that I still drink it almost daily now 2 years postpartum. What are the benefits of nettle leaf tea during pregnancy? It is high in calcium, vitamins A, C, D and K, as well as, potassium, phosphorus, iron and sulfur. Helps ease leg cramps – I had severe leg cramps during my 1st pregnancy. 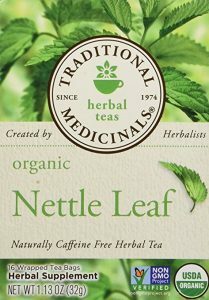 After adding nettle tea to my daily routine during my later pregnancies, I rarely experienced leg cramps. This nettles tea for pregnancy will help boost nutrients and tastes great mixed with other teas! Eases indigestion – if you are having a lot of indigestion early in pregnancy, maybe you are having a boy! (That’s an old wives tales that turned out true for me.) 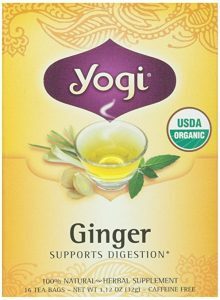 But really, drinking ginger tea during pregnancy reduces indigestion. 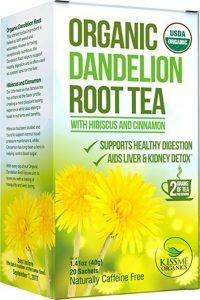 The earthy taste of dandelion root makes this tea one of my favorites. I used it to help with bladder and kidney issues. Fair warning you may find yourself going to the bathroom more (I know, you are thinking – as if that is even possible), but the cool thing about it is the bladder actual feels more empty and relieved. High in vitamins A, B, C, D, calcium, potassium and iron. Source of folic acid. Gentle diuretic that can be used for pregnancy related water retention and swelling. Reduces risk for urinary track infections. Helps to purify the blood, regulate blood sugar and improves blood circulation. For preeclampsia – In Wise Woman Herbal, Susun has a whole section on the best herbs for preeclampsia and diet recommendations used to help women have healthy pregnancies. It’s a great resource for anyone diagnosed with preeclampsia. Definitely check it out. Peppermint is another safe herb for pregnancy. 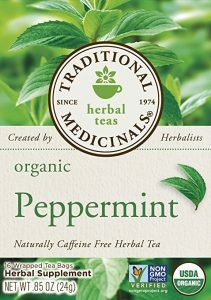 Drinking peppermint tea while pregnant can have an uplifting affect. Many moms find drinking peppermint tea in early pregnancy helps with nausea. While many prefer the taste alone, I like to mix it with other teas. For example 3 tea bags of red raspberry leaf tea + 1 bag of peppermint tea + 4 quarts of water + 2 tbsp of raw honey. Then chill. It makes a lovely pregnancy iced tea. High in potassium, and a good source of manganese, copper and vitamin C.
What is the best postpartum tea to drink? These teas are all safe for breastfeeding moms and baby! Wondering what to eat to produce quality breast milk? Read this post for foods that can increase your milk supply! Red Raspberry Leaf Tea – Again red raspberry leaf is the star herb for postpartum recovery. Drink it for aiding in relief from after pains. Help with producing adequate supply of breast milk. Helps ease pains after birth – due to its high calcium content, nettle is an excellent choice for easing uterus and leg pain in the days after childbirth. The recommendations in this post just barely touch the surface of the wealth of wisdom that lies within Wise Woman Herbal for the Childbearing Year. It covers pregnancy, postpartum and infant herbal care. It’s a resource that all natural mama’s should have on hand! Read it for FREE here with Amazon Kindle Unlimited! Disclaimer: The information in this post is not intended to replace medical information. Do your own research and consult your care provider before consuming any of the products mentioned. Our goal here at Birth Eat Love is to make healthy eating easier for pregnant and postpartum Moms becasue eating healthy and feeding your family shouldn’t be hard or stressful! Read Part 1 of the Nourish Your Pregnant Body Series – 11 mistakes that might be making your pregnancy uncomfortable. Learn the common mistakes we make when it comes to eating a healthy pregnancy diet and simple solutions to help you overcome them. Are you a busy Mom trying to eat healthier and not go crazy? These 21 Time Saving Kitchen Tips can help! Preparing for the postpartum period? Or just had your baby? Check out this post for a list of items that can help you recover naturally after having a baby! 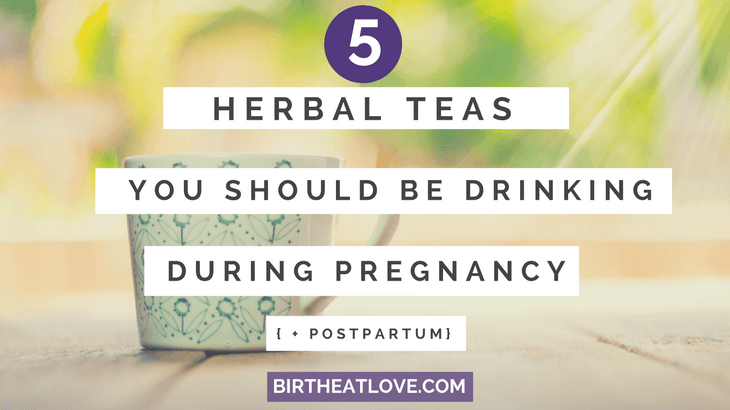 Do you drink herbal tea during pregnancy? What are your favorites? Tell us in the comments below! Healthy Pregnancy childbirth preparation, pregnancy food, pregnancy tips, tea. permalink. Hello! I just found out I was pregnant a few days ago, and instantly took to the internet to find out what teas to avoid, since I am an avid tea drinker. I found your website and went to the store and purchased some of your recommended teas, one being raspberry leaf. I was doing further reading and I found several websites that say do not drink raspberry leaf tea until after the first trimester as it is said to cause miscarriages. 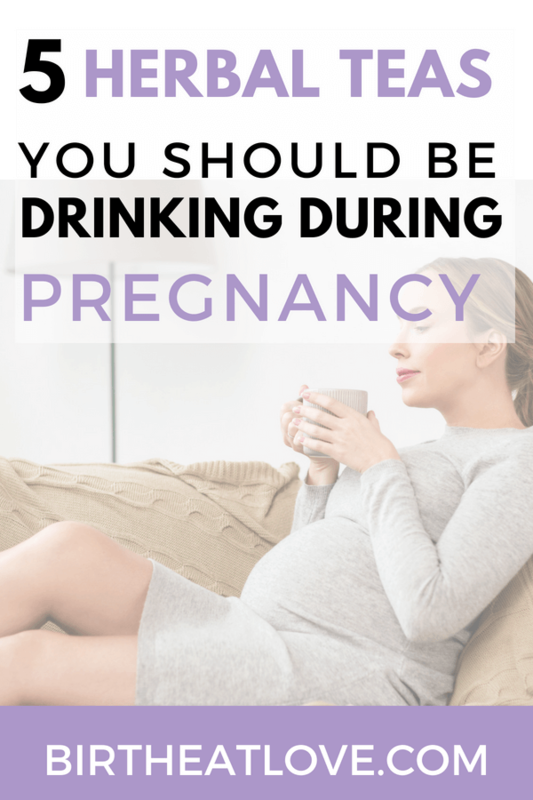 Of course other websites says it’s ok to drink throughout pregnancy. I am just curious how you obtained your information about this tea and if you could provide your source. This is actually my first time drinking raspberry leaf tea and I love it! I would just like to find a more concrete answer! Thank you for all of the information on this website! Thanks for your comment Kayla! 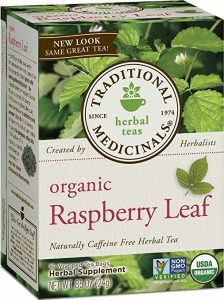 You are right, there is a lot of conflicting information out there about raspberry leaf tea. I relied on my source which was the book Wise Woman Herbal for the Childbearing Year by Susun Weed which suggests (on pg 19) its use for morning sickness, as well as my own personal experience. That said there are more medical based resources that suggest its best to err on the side of caution and wait until at least 16 weeks to consume. I find as in many things in pregnancy there are conflicting sides when it comes to anything “natural” and that you have to make the call as to which sources you trust. As always, consult your midwife or care provider when making decisions regarding your pregnancy. I love how you point out that tea is not only an acceptable drink during pregnancy, but also a nourishing one. My sister is pregnant right now, and she wants to make sure that she gets all the nourishment she can for her little one. I think she would really benefit from drinking tea and learning more about the different benefits.